The Award Committee assessed the finalist books for 2018 based on the publically posted award criteria, and aided by the award descriptors we developed to quantify the qualitative features of each nominated book. The first question the Award Committee confronted was: ‘What’s a career book?’ There are various definitions, but the one that I like is more an ‘understanding’ that evolves from the Core Skills for Work Developmental Framework. This framework was initiated by the Australian Government and the Business Council of Australia in 2013, and has been explained for the general reader in The Australian Career Passport: cross the career border with your core skills for work. 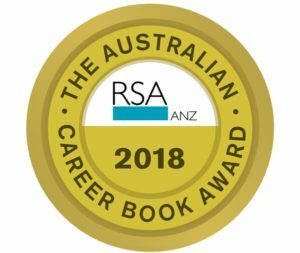 The first of the 10 Core Skills for Work is ‘manage career and work life’, so a book that helps people doing work activity, and the career coaches helping them ‘manage career and work life’ is a career book. It’s a wide definition that I think encompasses all of the very different books we see here today. The Award Committee reviewed the books based on five criteria – readable, reachable, reliable, relevant, and researched. You’d hope every career book would be readable, but what we mean is – did the writer understand the audience and purpose of the book? There seem to be five types of books in the career space. The ‘how-to’ book is one we’d immediately recognise – How to kickstart your career, or How to write a great CV. It’s packed with advice on career implementation and career development. There’s usually some kind of personal self-assessment of the reader, some analysis of important issues in the job scene, a number of entry points into the text, and plenty of reader exercises. That’s all expected … but the Award Committee was also looking for some kind of vision or overarching narrative operationalized throughout the text, and defining a neat and practical package for the reader. As well as administering career activities, career coaches like to help their clients develop a career vision for their stage of life, so it’s only fair that career writers have some identifiable vision in their books. The second type is the list book – 101 ways to improve your career or 120 ways to achieve your purpose with LinkedIn. The list book may not have the narrative element of the ‘how to’, but should be packed with practical advice to solve the reader’s micro-problems, with advice that’s easy to find with an easy layout, and a great index. The more it looks like a computer manual, the better. Then, there’s the career memoir book – generally written by some international entrepreneur or national celebrity – I did it my way. This may be short on specific advice on how to start that international airline, but will be big on inspiration that will help in getting the readers to ‘get up and find’ their ‘get up and go’, and then ‘get out and do’. This type of book may not have in-depth exercises, but should deploy some writing strategies to encourage deep reflection by the readers to help them turn inspiration into perspiration. An extension of this – the interview book, or case studies book will be packed with similarly inspirational stories of people who overcame adversity to develop a stellar career. These will usually be well-known people from industry, the media, entertainment, and particularly sports. If they overcame illness, injury, bankruptcy, humiliation and prison, or just leaving football … how easy is it for you? There are also specific sector books that prepare readers for specific occupations, and that provide advice on how to enter and thrive in these occupations. Then there are some books that jump the genre hurdles and become thought leadership books – and we’re always looking for one of those. They change, not just what career changers do, but the approach of the career coaches helping them. The RSA is a society fostering 21st century enlightenment, so we’re keen on promoting thought leadership across all sectors. So … different books for different purposes, but all helping people ‘manage career and work life’. Many career readers will seek out books to deal with specific career issues. There are also general career readers who have no immediate problems to solve, but who know they what to be doing more with their careers – just like ‘The Woman on the No 70 Tram’. She gets on a couple of stops after me, and heads for that that single seat near the back door where she won’t be disturbed by schoolbags or schoolboys, and takes out the book of the day. She’s dressed for a city office role – except for the runners. Don’t worry, she has the real shoes in a massive tote bag that has all the daily supplies – including the current book. Over the years, she’s worked her way through fifty shades of literature, but one morning, I really paid attention because she took out a pen and notepad, and a career book. Unfortunately, it wasn’t one of mine, but one by a well-known celebrity CEO. His book was everywhere, every bookshop, on the internet, and that massive electronic billboard outside the QANTAS Club at the airport. One of my clients reported seeing a billboard in New York. He even had his own TV show. All that evaporated in a massive and public fall from grace over seven days! But, I saw his book in Dymocks last week. Fortunately, with The Australian Career Book Award we’re awarding the book, not the writer. The Woman on the No 70 Tram was totally engaged in the text and doing the exercises, until she did the shoe change and confidently strode off into her office for a day of ‘managing career and work life’. For this award we’re highly attuned to writer engagement with the reader, and have developed the award criteria to assess that. There’s not much point having a great career book that nobody knows about, so ‘getting the book out there’ is an assessable activity. The big publishers have a competitive advantage here – the staff, the processes, the presence, and the budget. The niche publisher, the independent publisher, and the self- publisher have to work ten times as hard to ‘get the book out there’. It’s traditional to do conference and public presentations, but the internet is a big help here. The writer may not get onto the Breakfast Show, but having a dedicated website for the book; having the book available online; engaging in online discussion; and submitting relevant articles for online publications are some strategies we’d like to see to make the book more reachable for the woman on the No. 70 tram. Career coaches have a fiduciary responsibility to deliver accurate and timely advice to their clients, and so do career writers. Everyone is entitled to an opinion, but opinions given to readers should be accurate, because they will rely on those opinions. The awarded book should present opinions based on fact, not on urban myth. The woman on the No. 70 tram is trusting us. Writing a career book is a great opportunity for writers to present their opinions on what should be happening! That’s probably why they’re writing these books. The opinions and advice should be relevant to the current Australian workplace, and not the US situation, and not the Australian situation that prevailed when the career writers first got their career qualification. The awarded book should present state-of-the-art information that is current, and also looks forward to an evolving workscape. Career books don’t come with crystal balls, but futurism is part of most LinkedIn posts, and informed futurism is expected by the readers. Vision is part of the career development process for the reader, and vision is the start of the writing process for the writer. There is plenty of conflicting research on every career topic, and the writer has to be tough-minded on choosing the version to accept and promote. We’ve all heard the Artificial Intelligence predictions – by 2030 40% of jobs will be fully automated!! Considered Australian research estimates that 9% of Australian jobs will be fully automated, and that others will absorb robotic influence as needed. We’re not impressed by references to conflicting catastrophic collapse predicted by the International Committee of This, or the World Institute of That, but by how the writer understands, analyses, and uses appropriate research to present topics and information the readers can use to improve their careers. We want to see this research, not merely mentioned in chapter1 to scare the reader, but the implications of this research for the readers deployed throughout the book with reader extension through targeted exercises and reader reflection and planning. This gives the readers both the confidence and the mechanism to exert control over a changing career situation. These are very high standards for the writer to attain, and for the Award Committee to administer. To provide some guidelines for this, we’ve developed a set of descriptors applicable to any type of career book. The committee based their decisions on these descriptors to ensure a criteria-based result. At no stage did we rank the books, or attempt to come to a group consensus – the adding of member scoring sheets was the concensus! I’d like to thank committee members for their commitment, their analytical approach, engaging discussion in committee meetings, and for writing the book reviews of the finalist books 2018. One of the many things I liked about the finalist books as they were coming in was their wide target audience range, covering the whole life-span. Dr Catherine Hughes’ Careers work in schools series of books targets career coaches and career development facilitators in high schools who are helping a wide age range of pupils. These books help them evaluate program readiness, and decide what type of career intervention is appropriate within their resources. The other writers take us through the rest of the age range. Dr Srivastava’s What it takes to be a doctor helps young people thinking about entering the medical profession, and gets them asking themselves the tough questions. Michelle Gibbings’ Career leap helps career changers develop strategies to attain their aims, Joanna Maxwell’s Rethink your career helps career changers in their 40s, 50s, and 60s with practical suggestions and exercises. Finally, Hunter Leonard’s Generation experience assists those who move beyond conventional jobs and several careers to start their own consultancies or businesses. This year’s books cover the different genres of career books, and communicate with a wide range of readers across the career span. The understanding and cooperation of so many people has made this award possible. I’d like to thank the Career Development Association of Australia, and Australian Careers Service for facilitating my constant award posts on their LinkedIn groups. The award would not have been possible without the support and behind scenes negotiation by Philipa Duthie, the RSA ANZ Director. We first discussed this award last December. She saw the value immediately, negotiated it methodically, wrangled the budget creatively, and we started the process in April 2018. I’d also like to thank the RSA ANZ Board for taking on the task, and allocating the resources. Finally I’d like to thank the writers. They had the creativity to initiate an idea, the courage to communicate it, and the desire to make a difference in people’s lives. They emulate the long-standing tagline of the RSA – creativity, inclusivity, and responsibility. I would like to thank all the writers of nominated books for 2018.